At the 2005 American Library Association Conference in Chicago, I sat in on a session focusing on GIS data and data clearinghouses.One presenter used the phrase "the road not taken" to describe the path he had decided, obviously, not to take in the development of their clearinghouse. 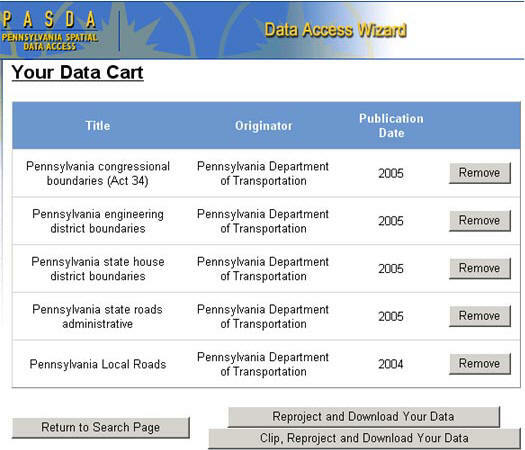 The presentation made me contemplate the road taken by clearinghouses in general, and in particular, the road taken by the one I'm involved in here in Pennsylvania, Pennsylvania Spatial Data Access (PASDA).What has changed, what's new, and what is on the horizon? But first, a word about PASDA. 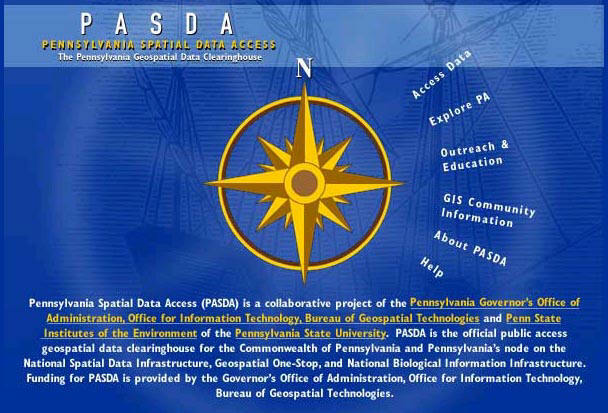 PASDA is Pennsylvania's official public access geospatial information clearinghouse.It was developed as a service to the citizens, governments and businesses of the Commonwealth.PASDA is a cooperative project of the Governor's Office of Administration, Office for Information Technology, Bureau of Geospatial Technologies and Penn State Institutes for the Environment of the Pennsylvania State University.Funding and support is provided by the Pennsylvania Office for Information Technology, Bureau of Geospatial Technologies. 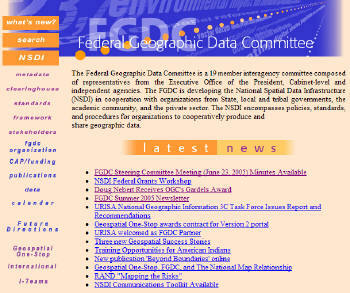 The impetus behind the clearinghouse movement, and still a driving force in it, is the Federal Geographic Data Committee (FGDC), which helped push the National Spatial Data Infrastructure (NSDI) forward.In addition to promoting and supporting the development of the clearinghouse concept, the FGDC and its staff have been brave enough to tackle the most dreaded of all subjects to a data creator - metadata.Metadata is NDSI's backbone as it is for clearinghouses everywhere.Needless to say, without FGDC's consistent efforts and its early efforts to fund clearinghouse and metadata development, many clearinghouses would not exist. The FGDC still continues to foster clearinghouse development and has also, in recent years, supported Web-based mapping initiatives such as those fostered by the Open Geospatial Consortium.The US Department of Interior and the FGDC have also been major proponents and partners in Geospatial One-Stop - the latest cooperative initiative involving many Federal, state and non-governmental partners. 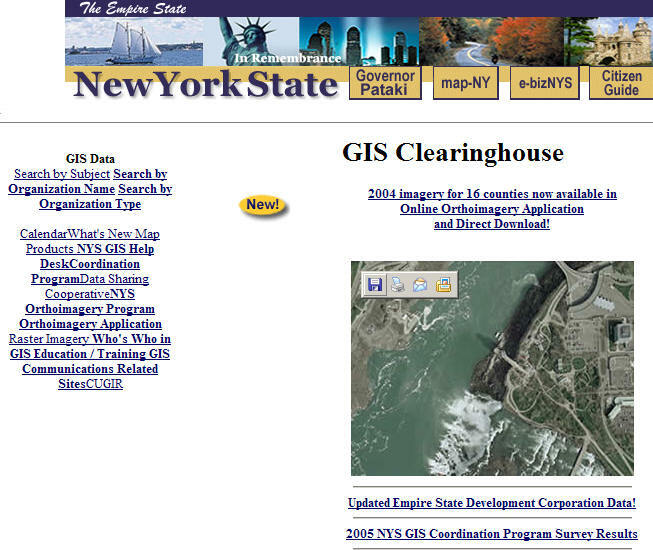 Like many of the clearinghouses in the US, PASDA began in 1996 as a simple FTP site with some GIS data and corresponding metadata records. 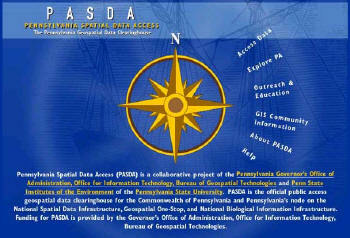 PASDA was originally funded by the PA Department of Environmental Protection and is currently funded by the Pennsylvania Bureau of Geospatial Technology.The clearinghouse is housed at the Pennsylvania State University Institutes of the Environment.Initially, PASDA was connected to the NSDI and searchable through Z39.50 protocol and Isite software - an open source program acquired from FGDC.Within three years, Pennsylvania was one of about 25 data clearinghouses to be searchable through the NSDI - others included New York, Texas and Arkansas. 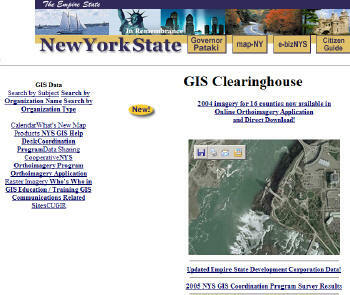 As the clearinghouse movement grew, a new paradigm arose to reflect the changing technology and needs of users.It was also at this time that the horizon and benchmarks for clearinghouses began to change.As GIS software became more widely used and users became more proficient, clearinghouses began to expand their services beyond simple data downloads.Web GIS, as it was called, began to drive clearinghouses to push the envelope of access and technology.One of the first major partnerships to promote Web-based GIS or map services was the Geography Network (GN) developed by ESRI.The GN set the tone for cooperative efforts across the country (including the current Geospatial One-Stop initiative).In 2000, PASDA was one of the first organizations (others included the Texas GIS data clearinghouse and National Geographic) to be part of ESRI's GN. 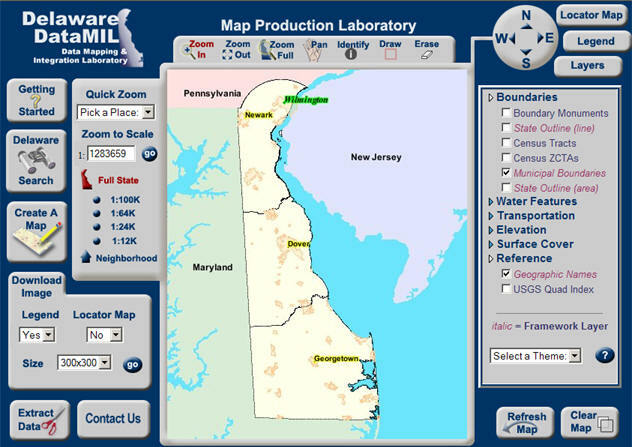 Another clearinghouse which embraced Web GIS in its early stages is the Delaware GIS Data Clearinghouse - the home of the Delaware DataMIL. The evolution from FTP sites to map services has been fast and furious - most, if not all of the early participants in the NSDI have taken this road and embraced new services and technology.PASDA is no exception. 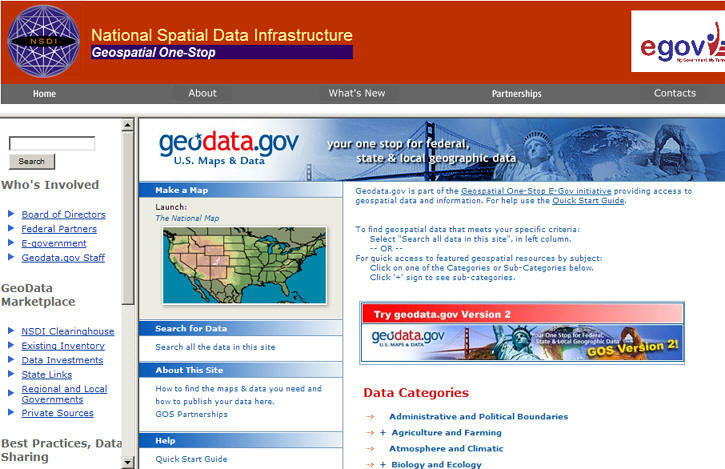 Over the past six years, the growth of PASDA - both data and services - has been exponential.From the original 35 data sets and metadata records, PASDA has expanded to included thousands of data sets and evolved from an FTP site to a User Centered Interface (UCI), accessing data via database queries and state-of-the-art map and Web services. The data made available through PASDA are provided by data partners to encourage the widespread sharing of geospatial data, eliminate the creation of redundant data sets, and to further build an inventory (through development and hosting of metadata) of available data relevant to the Commonwealth.PASDA serves as the public resource for locating data throughout the Commonwealth through its data storage, interactive mapping/Web GIS applications, and metadata/documentation efforts. PASDA services are provided free of charge to all users.The data on PASDA are provided by federal, state, local and regional government agencies, non-profit organizations, and academic institutions throughout the region. So much of the focus in GIS is on the technology - software, hardware, databases and/or functionality, that often the human factor is forgotten.But no article on clearinghouses would be complete without a discussion of the importance of partnerships and positive relationships with data creators and developers.Over the years, the core of the existence of a clearinghouse and ability to succeed sits squarely on the shoulders of data partners and funders.The PASDA model, unlike, for example, the New York model, which is a data cooperative requiring membership to access data, is to provide data free to anyone with an Internet connection.There are no data licensing agreements, membership or login requirements. To participate and share data with a clearinghouse takes time and effort on the part of the data creator - even with support from clearinghouse staff to create metadata and transfer data.This time is well spent because it benefits hundreds of thousands of users every year. Developing a data partnership involves more than simply acquiring data. In order to keep relationships strong and growing over time there must be trust among the stakeholders, and responsiveness from the clearinghouse. PASDA offers many services to the Commonwealth.Maintaining metadata is one of the primary services provided by clearinghouse staff.Metadata is the basis for all of the capabilities of the clearinghouse - from searching to data customization.PASDA staff provides free metadata training and development for all of the data partners. As PASDA evolved, like many of the state data clearinghouses, out of the FTP mold and into the world of relational databases and Web GIS, there were a number of significant challenges.Most important, what services should be developed and how? In order to answer these questions, PASDA has undertaken a program of scheduled strategic planning sessions.The first occurred in 2000/2001 and has occurred approximately every two years since that original session.The result of these strategic planning sessions, which included input from users and data partners throughout the state, was the development of customization tools and Web mapping applications. One of the first applications developed that moved beyond simple display of data was the Pennsylvania Atlas. Ryan Baxter, primary ArcIMS developer and technology coordinator for PASDA, incorporated clip and reproject functions into the atlas. 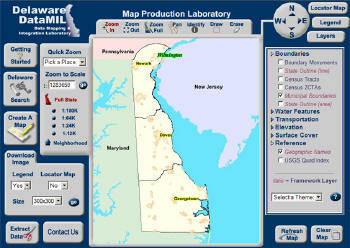 As an alternate to using a map interface, the Data Wiz was developed. 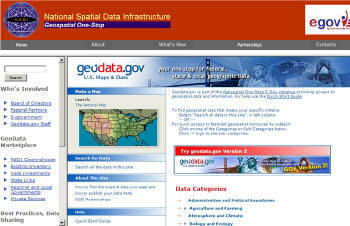 David Walrath, the primary Web GIS programmer for PASDA, developed download, clip and reproject capabilities using ESRI software.The Data Wiz has since morphed into what is referred to as the UCI.The UCI, which was made available to the public just this past July 1st, will be the transition vehicle for PASDA to integrate data search, display and customization capabilities.The UCI project involved all aspects and talents of the PASDA staff - from the data manager and metadata coordinator to the technology coordinator and the Web GIS programmers. 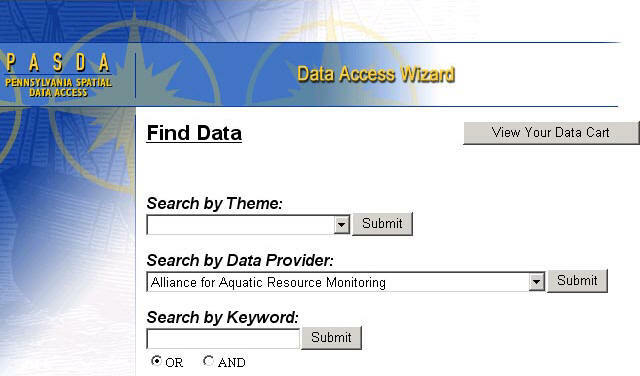 Data is loaded into ArcSDE and accessed via database queries.Users can select data, which is then added to a virtual "Data Cart," and then, if necessary, customize, clip (to county, watershed, municipality, etc), reproject (users can select predefined or custom projections) and download all of the items in a data cart in a .zip file.This interface saves users time and effort. 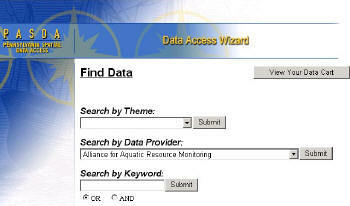 Several other specialized applications have been developed to help access and use some of the datasets that were available through PASDA. 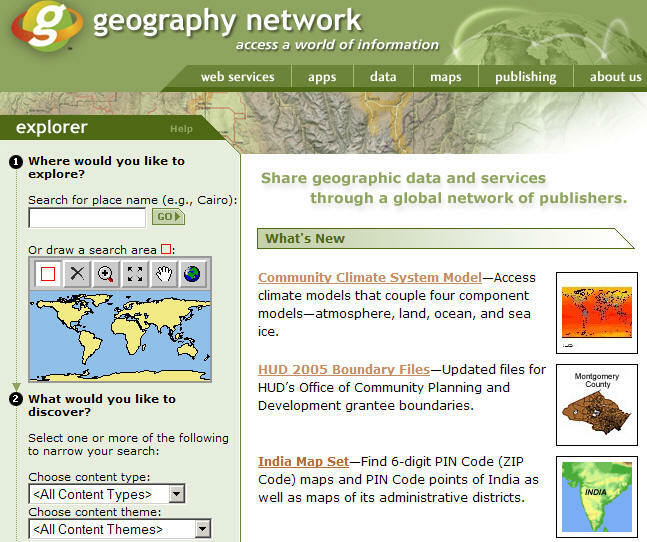 The Census Mapper, developed by Ryan Baxter, allows users to select Census 2000 data from SF1 or SF3, display that data, and clip and download them.There are approximately 1 billion potential combinations of data and geography available through the Census Mapper. 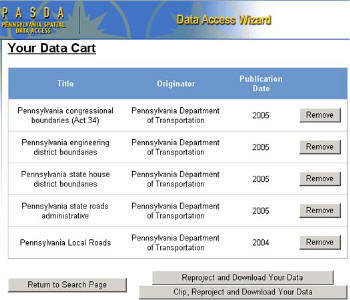 Another issue that arose during the last five years was how to provide access to Web GIS applications and services that are related to Pennsylvania but were not developed or hosted by PASDA.PASDA serves as the GIS data inventory source for the Commonwealth.Whether an organization's data are hosted on PASDA or hosted locally, PASDA still works to develop metadata for the data and integrate them into the overall data inventory.This effort to capture and inventory the existence of data should be maintained - even in a distributed Web GIS environment, so that information is still easy to find through a central portal.Ryan Baxter has observed, "potentially, as more organizations become proficient with Web GIS, they are more likely to serve out Web-based versions of their own data." To address this, PennCat, the Pennsylvania Catalog of Internet Map Services and Applications, was developed to serve as a catalog of Web GIS applications and map services hosted across the region, and to provide a seamless way to integrate these data into desktop GIS applications. 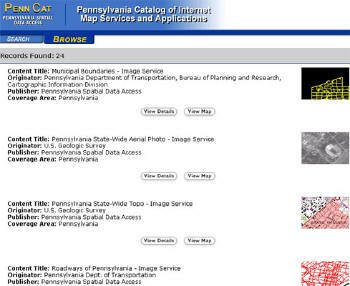 Another primary goal of PennCat is to provide access to Web mapping image services, such as a statewide mosaic of aerial photography and USGS DRGs (digital raster graphics, scanned quad sheets).By providing these image services, users can access the data from their desktops via the Internet, use them, and save them as part of their project - without ever having to download the data.This saves time, money and effort for users, and has become one of the most frequently used services we have developed. 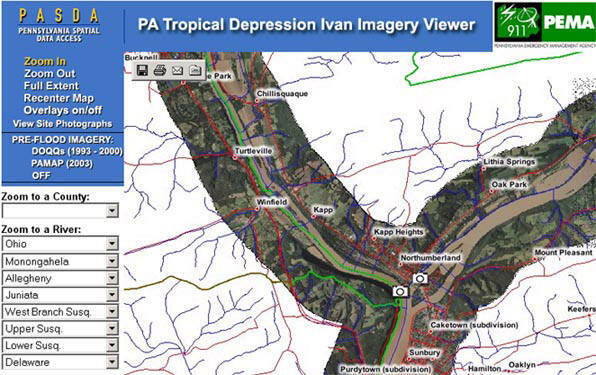 PASDA also works to support special initiatives by developing resources and providing access to data that go with them.There are several examples of this.The most recent is our work with the Bureau of Geospatial Technologies, the Pennsylvania Emergency Management Agency (PEMA) and PennDOT to develop flood mapping applications.The first application developed was the Tropical Depression Ivan Imagery Viewer. This project - flooding is the primary natural disaster in Pennsylvania - enabled users to access aerial photography, view pre-flood and post-flood imagery and also view on-site photos of flood damage.A second, similar application focused on spring 2005 Delaware River flooding. 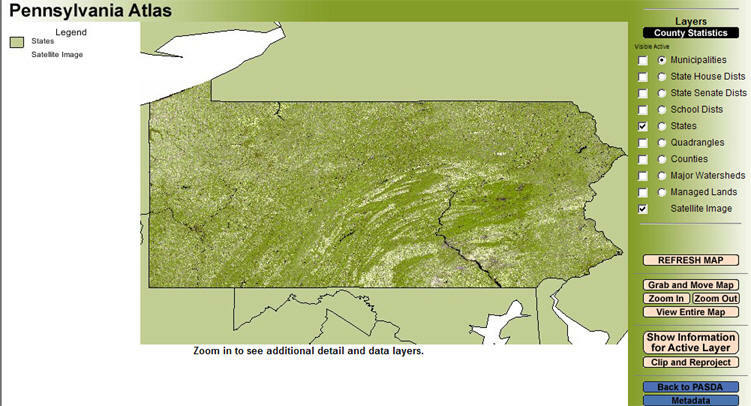 Another project for which PASDA provides support - in terms of data storage and metadata development - is the PAMAP program.PAMAP is the Pennsylvania version of the USGS' National Map program.PAMAP is a DCNR program run by the Bureau of Topographic and Geologic Survey in partnership with the Governor's Office of Administration, the Office for Information Technology, the Bureau of Geospatial Technologies, the USGS and Pennsylvania county governments. Like other clearinghouses in the country, PASDA must continue to grow and meet the needs of its users.With significant increases in the volume of data available, particularly imagery, enhanced and new map services and image services are on the immediate horizon.Some clearinghouses are also developing Web services - address geocoding/matching, for example, for users.Most important for PASDA and a key component to any clearinghouse - metadata development will continue to be the linchpin of our growth and success.Continued vision and leadership from the state and input from users will help guide us through the next few years and help direct the next segment of our travels down the GIS clearinghouse road in Pennsylvania.